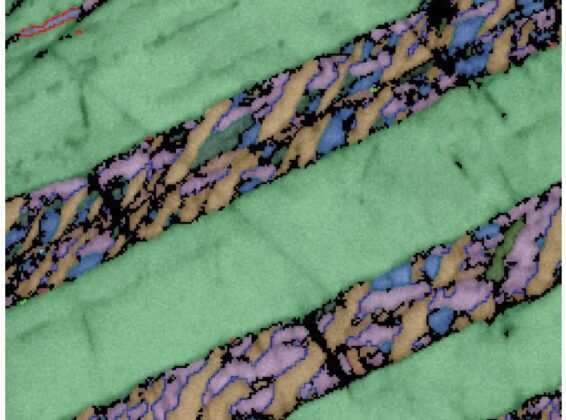 The new study, published in the journal Geology, is the first to document evidence of a new form of the mineral monazite, which only exists on Earth during the immense pressures exerted by meteorite impacts. Study co-author Associate Professor Nick Timms, from Curtin's Space Science and Technology Centre, said the international research team made their discovery by looking at tiny rock fragments from impact craters in Germany and Canada using a high-powered electron microscope. "We found microscopic evidence that monazite, a rare earth element phosphate, transformed to another crystal structure under high pressure from a shockwave, similar to how graphite can turn into diamond under pressure," Professor Timms said. "However, the mineral reverted to its original crystal structure instead of maintaining this new structural form, and while the new mineral only existed for fractions of a second as the shockwave passed through the Earth close to ground zero, it left unique crystallographic clues to its existence. "We are on the verge of discovering a new mineral, but there is a hitch because the mineral is not stable at the Earth's surface and readily transforms back to monazite again. Therefore, we have really only seen, and will probably only ever see, its 'ghost'." The evidence for the new mineral was found at two ancient meteorite impact craters – the Ries Crater in Germany and the Haughton impact structure in arctic Canada – but until the elusive mineral is found preserved in rocks, scientists cannot give it a proper name. Curtin alumnus Dr. Timmons Erickson, now at NASA's Johnson Space Center, was the lead author of the study "Shock-produced high-pressure (La, Ce, Th) PO4 polymorph revealed by microstructural phase heritage of monazite."